I last updated on my shares portfolio in August. Since then I have made just one further purchase - small cap financial services firm, Charles Stanley in September. The portfolio has therefore expanded to a total of 24 shares and I have allocated £1,500 to each of the additions making a total capital input of £36,000. Although this is demonstration income portfolio, it mirrors my own holdings in all aspects except weighting for each share. 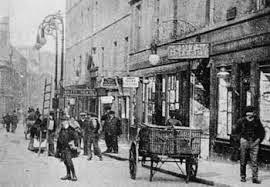 As with my investment trust holdings, I withdraw most of the income from my shares for living expenses. With this demonstration portfolio I will reinvest the income at the end of each year either into an additional holding or recycle the income generated into one of the existing shares. At the close of business yesterday, the FTSE 100 was 6,722 - still below the level of 6,749 at the beginning of January 2014. The shares portfolio has returned 3.4% year-to-date which includes dividends of 3.7%. The effect of the additions in recent months means it is difficult to make an accurate comparison. The only way to do this would be to unitise the portfolio. Also, some of the additions made later in the year have not yet contributed a full years dividend. However, it appears the portfolio has made a little progress since the last update in August. As I have said in previous posts, I am not particularly focussed on capital values - share prices will rise and fall. The dividend income is far more stable and predictable. It is well documented that, over the longer term, dividend growth and, where appropriate, the reinvesting of dividends will provide the lion’s share of overall returns from an equity portfolio.Dividends are the most important aspect for me and these continues to roll in very much as expected with the exception of Tesco. All the companies in my portfolio have declared full year dividends for 2014. Most have delivered above-inflation uplifts, and several have increased their dividend by over 20% - IG Group, DS Smith, easyJet, Legal&General, Sky and Plastics Capital. The average increase for the portfolio over the past year is 13% which has made quite a difference to income this year. According to the rule of 72, if dividends were to increase at a similar rate each year, my dividend income would double every 5.5 years. Of course, I am not expecting double digit income growth every year. The interim dividend for Tesco was reduced by 75% and the final dividend is likely to be significantly lower next year. Likewise with Sainsbury. Commodities have been under pressure for most of the year. Working on the principle of reversion to mean, I have decided to top up my holding of BHP Billiton. At the current purchase price of £14.60 - down from £19.85 in August - the yield is now approaching 5.0% subject to currency exchange. The surplus dividends of £1,416 will cover the purchase of a further 96 shares after dealing costs making a new total of 166 shares. Charles Stanley is one of the UK's leading independently owned, full service stockbroking and investment management groups. It is one of the oldest firms on the London Stock Exchange with its origins in a banking partnership established in Sheffield in 1792. Over the past two centuries, it has grown both organically and via acquisitions and developed into the modern day stockbroker firm offering a wide range of services to both individual investors and corporate clients. This is the most recent addition to my portfolio. Prior to purchase, the share price had fallen around 40% - I am not the best when it comes to timing of my purchases (and sales! ), so I am pleased to see the share price appears to have stabilised over the past couple of months. The company have issued its half-year results to end Sept 2014 (link via Investegate). Revenues for the period increased 4.1% to 72.9m (2013 £70.0m) however costs were significantly higher at £77.0m. Excluding one-off costs, underlying profits were just £1.5m compared to £8.0m in the first half of 2013. Notwithstanding the reduction in profits, the board felt sufficiently confident to maintain the interim dividend at 3.0p - the shares trade ex dividend 5th December. Long standing CEO, Sir David Howard has stepped down and is replaced by Paul Abberley former chief executive of Aviva Investors. He has commenced a strategic review of the business to identify the measures required to enhance the profitability of the Group and drive its long-term growth, and will present to shareholders in due course. One of the considerations for my purchase (and also Hargreaves Lansdown recently) was the potential to tap into what I believe will be a growth area in the coming years - that is the self-directed diy investor. The roll-out of RDR has no doubt made the provision of financial advice and personal investment services more costly to deliver. This increasing cost will make advice-led service unaffordable and/or inappropriate for clients of more modest means with smaller portfolios. CSD offer the usual dealing a/c, ISA & Junior ISAs and SIPPs. Charges are very competitive and particularly attractive for the modest portfolio holding of under £50,000 as the charges are based on a percentage of the holding - 0.25%. This compares favourably with the likes of Hargreaves Lansdown 0.45% and Fidelity 0.35%. It is encouraging to see this is making good progress with a further 3,300 new a/cs added in the past 6 months taking the total to over 17,500. Revenues from CSD rose 66.7%. Hopefully the strategy review will be implemented in the coming months and the company can start to rebuild and restore a more profitable operation. At close, the share price was down around 2% at 308p. More on this small cap following the full year results. We are often advised to build a diversified portfolio - don’t put all your eggs in one basket. This means looking at asset allocation and spreading your investments between different classes of asset, market sectors and even differing continent around the world. One reason for this advice is because of the cyclical nature of markets. Some of the time equities will do well, at other times bonds will be the place to invest. In 2001, a smart move would have been gold which over the next 10 years increased from $200 to $1,200. Whichever asset you look at, there is a pattern of movements up followed by the inevitable move down again. Over the longer terms, the average between the peaks and troughs for any asset class can be plotted or calculated and the movements towards this average is called mean reversion. Whilst these cycles are easy to identify in retrospect, it is not easy for me or, I suspect, the average investor to correctly identify the turning point of these cycles. The point of building a diverse portfolio is to try and reduce volatility. As one sector of the market is doing well, another will be going through a difficult time. Rebalancing your portfolio, say once per year, involves selling some of the assets which have done well and reinvesting the proceeds into the sectors which have underperformed. Its all very well understanding the theory of mean reversion, but how can small investors apply the theory in practice to better manage their portfolio? For me, it helps simply to understand that the shares in my portfolio that have a good run one year, may underperform the next year. With my investment trusts for example, Aberforth - a smaller companies specialist- had a stellar run in 2012/13 with a combined return of 100%. I know that this year or next, there will be a corresponding underperformance whilst another sector of the market has its day in the sun. I like the contrarian approach of Alastair Mundy who manages one of my long-held investment trusts, Temple Bar. Much of investment management is premised on the view that there are excellent companies that consistently beat their peers and weak companies that consistently underperform. Mundy takes the opposite view believing that most companies revert to their long term mean. He believes most companies are normal and that if he buys the assets cheaply enough, the share price will rise and return to its long term average. His track record is pretty impressive - the trust has returned an average (cagr) of 10.6% p.a. 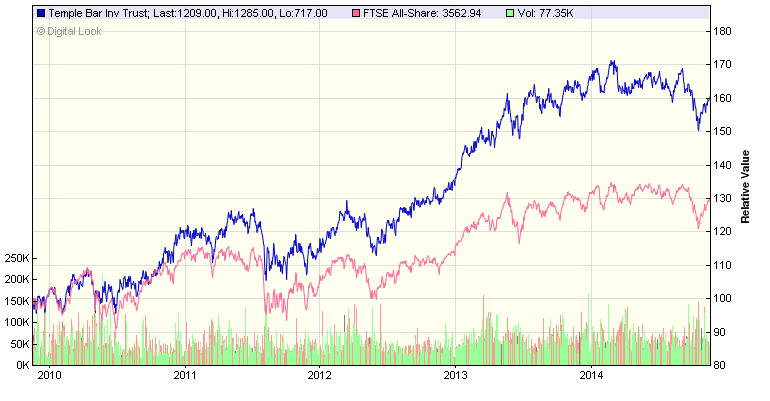 over the past 10 years compared to 7.8% for the benchmark FTSE All Share index. Looking at the wider picture it is always a good idea to check out the cyclically adjusted PE10 ratio or CAPE from time to time. This measures the price/earnings ratio of an index such as FTSE 100 averaged out over a 10 yr period to iron out the anomalies that a shorter period may give. At the present time, UK equities appear to be around the p/e 12 level, that’s below their long term average of around 15 or 16 - hopefully at some point they will revert to this average or rise above as it did around the turn of the millennium. Rather than try to recreate the illustrative charts, here are a couple of links to articles by UK Value Investor and also RIT. 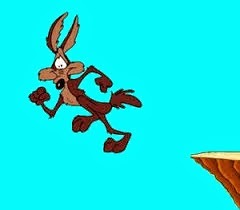 Of course, mean reversion can never give a clear and/or specific guide to timing, as I said earlier, markets can and do move against the tide for lengthy periods - a little like the cartoon character running off the edge of the cliff. For the average small investor however, if you understood nothing more than the fact that the markets and the economy move in cycles you would be far ahead of the majority of investors. Although this is a UK income trust, the manager is permitted to invest up to 20% of the portfolio in overseas listed holdings. Around 15% is currently allocated including Swiss Pharma, Roche and US tobacco firms Reynolds and Altria - these three are top 10 holdings and currently account for 12.7% of the portfolio. Edinburgh is been one of the cornerstones of my income portfolio held in both Sipp drawdown and ISA. I took the opportunity to top up my ISA holding again earlier in the year. Mark Barnett took over as lead manager from end January 2014. He also manages Invesco's Income and High Income funds which have combined assets of over £20bn - must be a busy chap! It has this week published results for the half year to 30th Sept 2014 (link via investegate). The Company's share price, including reinvested dividends, rose by 4.6% during the past 6 month period, compared to a rise of just 1.2% (total return) by the FTSE All-Share Index. The trust yields 3.7% based on the current share price of 640p. Following the departure of Neil Woodford, the independent Board of Directors renegotiated charges at the start of this year. The performance fee has disappeared and the annual charges are reduced from 0.6% to 0.55%. As a result, ongoing charges for the half year are just £3.7m compared to a whopping £15.5m at the same point last year - a saving of nearly £12m! Shareholders are also set to benefit from the significant savings in borrowing costs as the £100m 11.5% debenture has now been redeemed and replaced with a lower interest revolving facility from Bank of New York Mellon. The interest saving so far is £2.5m and the full year savings should be around £7.5m. These are significant savings which should translate to improvements in performance and, importantly, a better return for shareholders! More on this following the full year results, but so far, happy with progress made under the stewardship of the new manager. HFEL is a long standing member of my ISA income portfolio. It seeks to provide a high level of dividends, as well as capital appreciation over the long term, from a diversified portfolio. The principal areas of investment focus are Taiwan (20%), China (18%), Australasia (17%), Singapore (9%), Hong Kong (12%) and S. Korea (7%). Last week I posted the results of Schroder Oriental Income which operates in the same areas but with slightly differing weightings for each country. I last posted on HFEL following the results last November. Yesterday they issued full year results to end August 2014 (link via Investegate). 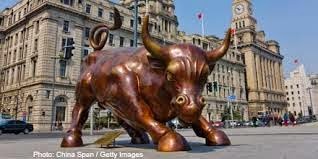 Building on last years total return of 8.8%, the Company have reported a share price total return increase of 13.5% compared to the benchmark MSCI Asia Pacific index increase of 13.3%. 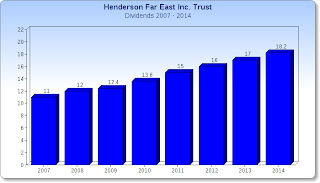 HFEL is the highest yielding of my 3 Asia-focussed investment trusts. Together they comprise around 9% of my investment trust portfolio. Over the year, dividends (paid quarterly) have been lifted by a very respectable 7% from 17p to 18.2p giving a yield of 5.6% at the current price of 324p. The dividend was comfortably covered by revenue income of 19.3p per share. Dividends have risen by an average of 7.5% CAGR in each of the past 7 years. At this rate, the dividends will double every decade. Last year, Henderson agreed to take a reduction in their annual management fee from 1.0% to 0.9% of the total value of the fund's net assets - there is no performance fee. Fees and expenses for the past year were £4.0m - around 1.2% of net assets and a welcome reduction from the previous year’s 1.4%. Although capital appreciation is a little weak compared to say Schroder Oriental, the dividend yield is much higher and is very welcome in today's low inflation/low interest rate economy. I am happy to continue holding for the longer term. 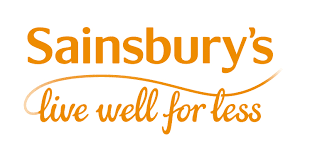 This time last year, Sainsbury was riding high - its share of the grocery market was the highest for a decade at 16.8%, following 35 consecutive quarters of like-for-like sales growth, online sales exceeded £1bn for the first time and the share price was 415p. A year later sales growth is in decline and the shares have tumbled 37% - to be fair, as far as I can make out they have not done a lot wrong as all the major players appear to have been affected to some degree or other. At the time of publishing their final results in May, sales, profits and earnings were up so I have been awaiting these results in the hope that some light can be shed into the reasons for the slump. They have today announced half-year results for the 6m to end September 2014 (link via Investegate). Profit before tax is down less than forecast -6.3%% to £375m (2013/14: £400m) whist basic earnings per share is down 12% to 14.5p (2012/13: 16.6p) . These figures for underlying results excluded a £665m charge, mostly from a reassessment of its store pipeline and a write-down in the value of unprofitable and marginally profitable stores. Due to increased investment in lowering prices to the tune of £150m over the coming 12 months, combined with expected lower profits from its banking operation, Sainsbury warned that its full year profits would likely be lower than last year's. Despite media speculation last weekend of a cut, the interim dividend has been maintained at 5.0p (2012/13: 5.0p). However, with the forecast of a reduction in H2 profits and a decision to target dividend cover at 2x, it is a probability the full year payout could be trimmed back. It is a little difficult to assess what the figure might be, but based on current analysts' estimates (which obviously may change) this would suggest a figure of around 9.0p which would make 14p for the full year, a reduction of around 17% on the 17.3p paid last year. Management are implementing a new strategy to address some of the industry challenges. Over the next 18 months, to improve the quality of 3,000 own-brand products, investing in range, innovation, packaging and merchandising, and deliver ethical sourcing in line with their values. 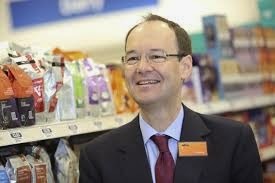 "Sainsbury's is a great business. Our consistent outperformance of our main supermarket peers over the past five years is evidence of this. We are facing into a once-in-a-generation combination of cyclical and structural change in the industry, but I firmly believe that this strategy, building on our unique heritage and track record of success and delivered by the most experienced management team in retail, will focus and energise our business to the benefit of customers, colleagues and shareholders alike." The results received a mixed reaction and by the end of today the share price finished just 3p lower at 265p. If my guestimate of 14p dividend is correct, this gives a current yield of 5.3%. Last month I topped up my holding at 260p - my breakeven figure is 300p so I’m hoping the recent turbulence is starting to settle down. Whether that was a good move or not only time will tell. More on this following the Christmas trading update. This is one of my long-standing income trusts providing exposure to the Far East and Australian markets. I last updated on SOI following last year‘s FY results. The trust has today announced results for the full year to end August 2014 (link via Investegate). Following on from last years return of 15.6%, share price total return for 2014 has increased by a very acceptable 15.2%, compared to the benchmark index of 11.3%. Over the past 5 years, average returns have been 15% per year (CAGR) compared to 7.0% for the benchmark MSCI Asia Pacific Index. Income has been curtailed by foreign exchange headwinds and has fallen 7% to 8.12p ((8.74p 2013). However, this still covers the dividend which has again been increased from 7.45p to 7.65p. A final dividend of 3.15p will be paid 28th November. Based on a share price of 193p, this gives a current yield of 3.9%. Net assets of SOI have increased some 8% from £395m to £428m. Of course, management fees correspond to the value of net assets and I am pleased to note these have reduced some 7.5% from £5.7m (2013) to £5.3m this year which includes a performance fee of £1.8m (£2.4m 2013). Ongoing charges are therefore reduced from around 1.6% to 1.3%. I am hoping the management may follow the trend of many other leading investment trusts - City of London, Edinburgh are two examples - and abandon performance fees before too much longer. This would make the trust even more attractive to investors - institutional and small retail alike. The basic fee is 0.75% of the net assets. The Manager is also be entitled to a performance fee of 10% of the amount by which the adjusted net asset value at the end of the relevant calculation period exceeds a hurdle of 107% of the adjusted net asset value at the end of the previous period multiplied by the time weighted average of the number of shares in issue during the year (still with me?!!). The portfolio is spread far and wide - the main areas for investment are Australia, Singapore, Hong Kong, Taiwan, Thailand, China and S. Korea. "If the hopes for reform may prove misplaced, there are some positive supports for the region. A combination of steady global economic expansion and falling commodity prices is beneficial to the regional export outlook, and industrial and information technology sectors are important components of the equity markets. National balance sheets are also, in general, sound with high savings rates, foreign exchange reserves and positive current accounts. These provide reassurance that the longer-term scope for domestic demand growth in Asia remains ample. At a stock level we continue to believe that the longer-term case for income investing in Asia remains securely based. The equity markets offer a diverse range of countries and sectors where solid income stocks can be found, and we take comfort in the strong aggregate metrics of the Company's portfolio in terms of superior cash generation, higher than average returns on equity and lower financial gearing". This holding, for me, has been another solid year and provides a decent level of income combined with exposure to growing economies and emerging markets. 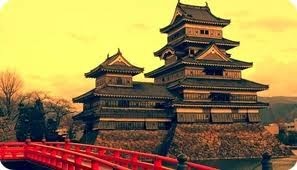 The Far East has long been a good hunting ground for the income seeker. I am pleased to see the charges coming down but the performance fee takes the edge off returns - having said that, the returns have outstripped the benchmark index over the past 5 years so, I suppose, no complaints. I am happy to hold longer term but probably not currently looking to increase my holding. I am primarily an investor for income. A large proportion of that income comes from the dividends from my equity portfolio. 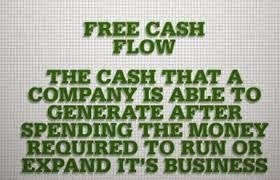 I also look at free cashflow cover (FCF) i.e the cash left over after profits have been reinvested in the business. It is from this spare cash flow that dividends are paid, not its operating earnings. It is important for me to ensure that the shares I choose to invest in can provide me with a growing income from dividends for many years to come. Of course, there are no guarantees when it comes to the stock market - the problems with Tesco over the past year or two for example, but I believe the more research I carry out prior to purchase, the better chances I will have of making a sound investment decision. This sounds simple, however when looking at a company’s dividend the most important aspect for me to consider is whether it is sustainable over the longer term. Accounting rules allow companies some discretion regarding the earnings numbers that they release. This can lead to distorted views of how successful a company is and struggling firms can appear as though they are producing stronger results. Cashflows do not allow the same wriggle-room that earnings offer. If a company has more cash going out than they have coming in, this will be obvious in the cashflow statement. Dividends are paid in cash, so a company that has paid a consistent dividend is likely to have a steady stream of cash coming in. Therefore, these companies possibly have solid business models and are expected to navigate a downturn in the economic cycle more easily. Monitoring a firm’s cash flows year on year will give me a good indication of whether or not the dividend is sustainable. If firms have negative cash flows, but are paying a dividend anyway, I believe they should be treated with caution. This will require a look at the latest results. 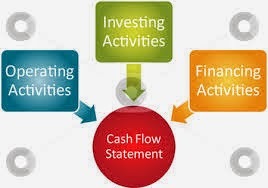 Scroll down to the Cash Flow Statement - usually after the Balance Sheet. A minimum cover of around 1.4x to 1.5x is usually what I look for to provide a reasonable margin of safety. The higher the cover for free cash flow, the more sustainable the current dividend in my book. If the FCF is below 1.0x or even negative, then I consider the dividend is possibly under threat - the company may be able to maintain dividend payments for a short period by extra borrowing but this would not be sustainable in the longer term. It is also worthwhile checking back over a couple more years to assess the level of FCF cover and to see if the cover is rising or falling - one years figure can be misleading. Earlier this year, retailer Next reported its final results - here’s a link via company website. You will find the Cashflow Statement (Unaudited) some ¾ down the report.. Cash generated from operations (before tax) is £766.8m, payments on capital expenditure to acquire PP&E is £102.6m and therefore deducting this from cash generated leaves £664.2m. The dividends paid is £164.8m. Therefore Free Cashflow Cover is 664.2/164.8 = 4.03x - I would regard this level as very safe. Another of my holdings is media company BSkyB which reported full year results in July - link via Investegate. Cash generated from operations was £1,769m (before tax), payments for capital expenditure on PP&E was £241 so again, deducting this from cash generated leaves a figure of £1,528m. The dividends paid for the year were £485. Therefore FCF Cover is 1528/485 = 3.15x - slightly less than Next but again, a very comfortable level of cover. Another important factor to consider regarding dividend sustainability is the payout ratio; while high dividends are important, a lower payout ratio - under 50% - tends to be a positive indicator. If a company is paying out nearly all of its earnings in dividends, this may be a sign that the dividend is not sustainable. Also, if the payout ratio is increasing over time, this might indicate that earnings growth is not keeping up with dividend growth, and the dividend is not sustainable. Companies with strong cash flows and low payout ratios have room to grow the dividend, and also tend to exhibit positive price appreciation. The ideal for me is a ratio somewhere between 40% - 65%. Shares that offer a more sustainable dividend often fall into so called defensive sectors such as utilities and telecoms (did someone say supermarkets? ), as these companies are not as negatively affected by a market downturn. When the economy retreats, as it has in recent years, consumers will limit their discretionary spending, so firms that sell non-essential products should see some decrease in sales. This can make sustaining a dividend particularly difficult for these companies. Firms in areas such as telecoms and utilities sell products and services that consumers have little option but to purchase. As a result it is easier for them to sustain a dividend, and suggests that they will make it through a recession more easily. Besides finding the right balance between dividend yield and dividend growth, companies with favourable cashflows are therefore the companies that I try to target as core holdings for my equity income portfolio. 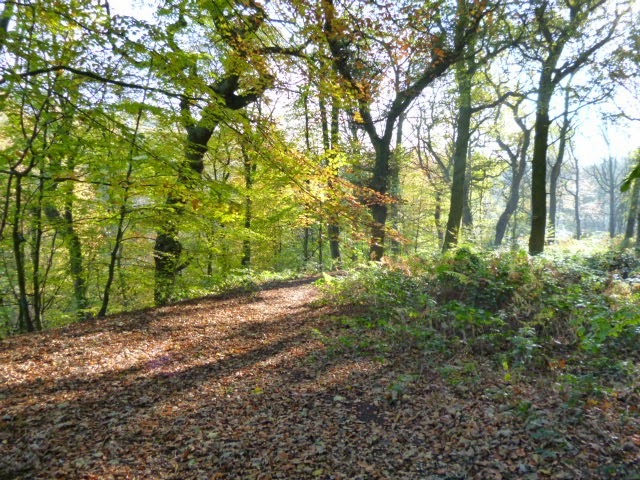 Take it easy - enjoy the wonderful autumn colours! Imperial are the 4th largest global cigarette manufacturer and world leaders in high margin premium Cuban cigars and fine-cut tobacco. 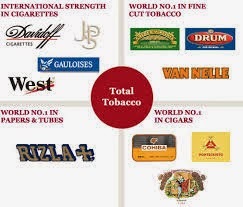 Some well known brands include Gauloises Blondes, JPS, Lambert & Butler, Golden Virginia, Drum and Rizla papers. The share price was £23.60 at the same time last year and IMT have had a decent run up 16% to (currently) £27.50 supported by a solid 5% dividend yield. Imperial have today released full year results for the 12 months to 30th September 2014 (link via Investegate). Group net tobacco revenues totalled £6.5bn, up 2% underlying but down 6% in actual terms. Imperial said underlying volumes of growth brands rose 7%, driven by sales growth and brand migrations. Its growth and specialist brands also made up 54% of underlying tobacco net revenue, up 3%. It said it performed strongly in growth markets outside established areas such as Europe and the US. It also said it had reduced stock held by distributors, particularly Russia and Iraq and had saved more than £60m during the year, putting it on track to save £300m a year by 2018. Overall adjusted net debt fell £1bn or 11% to £8.1bn partly due to proceeds from a partial listing of its European logistics operation which raised £395m. In July, IMT agreed to purchase a number of brands from Reynolds USA for £4.2bn. The deal is expected to complete next Spring and will be financed by additional borrowing. "This has been a year of significant delivery by Imperial. We've strengthened our brands and market footprint, improved cash conversion to 91%, reduced debt by £1 billion and delivered another 10 per cent dividend increase to shareholders. We've achieved what we set out to achieve, creating a stronger business in the process. Trading conditions remain tough in many territories but the actions we've taken to enhance the quality and sustainability of the business have put us in a stronger position." Once again, they have not disappointed on shareholder return and have lifted the full-year dividend by 10% to 128.1p (2013 - 116.4p). There is a promise of a further 10%+ uplift for the coming year which would mean 141p for 2015. The results have been well received and in morning trade the share price was up over 2% at 2750p giving a yield of 4.6% and cover of 1.6x adjusted earnings of 203.4p. The final dividend will be paid in February and will then be moving to quarterly dividends starting next June. Given the decent share price appreciation over the past year combined with top ups to several of my investment trusts which have significant holdings of IMT, I am reaching a point where I will become too overweight with this share. I will therefore monitor and may sell if the price continues to rise over coming months.